VIX sell off was a big surprise but is it time to hold it ? 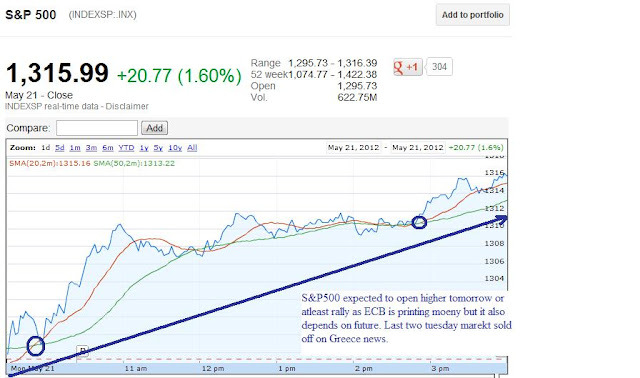 I hope many of you took advantage of ERX rally, it was up 6% today as alerted on Sunday's article. Today, S&P500 just needed to move 5 point up to bring, VIX back in contango. VIX saw massive sell off today which was completely unexpected as if all the fears are gone. Tomorrow is very important day for VIX, another sell off will bring back bulls in the driving seat. Remember VIX is not a good term investment you can use it as hedging for daily to weekly basis. Use vix to trade good quality stock instead of holding this risky stock. If VIX keep selling like this, then there is nothing wrong in holding as Euro zone problem is not over, just don't invest your life saving in it. 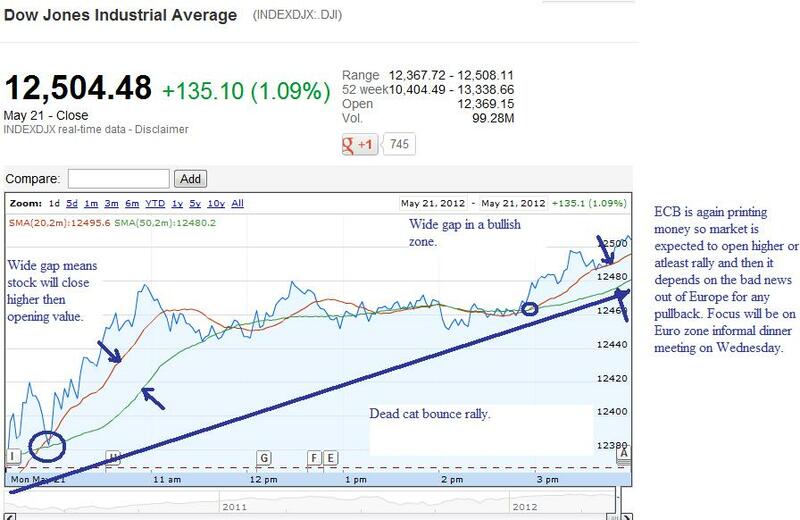 For Upside Dow needs to break 12,555 and for downside dow needs to break 12,422. I have a upside target of 12570 in this consolidation week, 12673 max before Dow test 12,215. 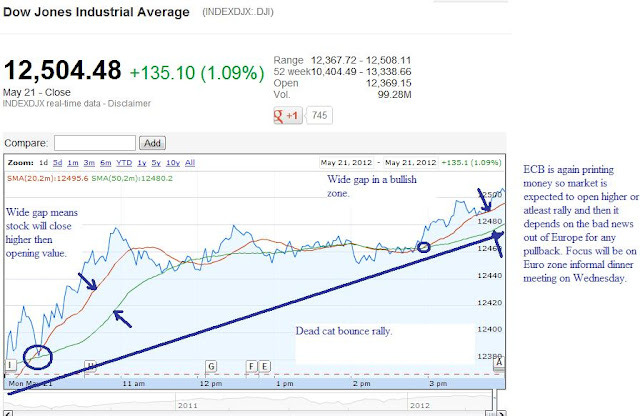 For Upside S&P500 needs to break 1318 and for downside S&P500 needs to break 1308. I have a upside target of 1328 in this consolidation week, 1335 max before S&P500 test 1282. Existing home sales data at 10 EST expectation of 4.66M, higher will be bullish sign, and lower will be bearish sign. For Long Term: Keep PCX, NOK, RVBD, AAPL, PCLN, POT, MT, F, MOS, CAT, FAS, ERX in your watchlist. For day trading watchout BIDU, AAPL, PCLN, MA, V, FAS, FAZ, TZA, TNA, TVIX, XIV, SVXY, UVXY, VXX, SPY, DIA, GLD, AGQ, INFY (remember volatility is not a long term investment option use it for strictly day trading) VIX is in Contango again after masssive sell off June future contract, so any bad news could lead to rally but it will go low at the close. So be careful with UVXY, TVIX, VXX. If you have missed out the rally then wait till Greece election is over. Please visit our sponsor at the top or side bar if you find this article useful.